Home » Food and Nutrition » Could This Seed Transform Our Dairy Products? Could This Seed Transform Our Dairy Products? You’d have to be hiding under a rock the past decade not to know the name “flaxseed.” The powerfully healthy seeds are now used in a wide variety of foods, making them healthier. But here is a new twist: flaxseed can lead to more nutritious milk…when cows eat them. Cattle that feed on traditional mixtures of corn, grains, alfalfa hay, and grass silage produce dairy products with low concentrations of omega-3 and other unsaturated fats. These are important fats that help the body withstand disease. So, researchers experimented with 10 cows, feeding them different amounts of flaxseed. The aim was to find out the amount needed to maximize the omega-3 levels in milk and dairy products without changing those products. PLUS: Why a high-fat meal can cause you stress. It turned out that the cow’s milk contained more omega-3 fatty acids and less saturated fat. That is a seriously big benefit. If we eat a diet high in saturated fat, it leads to high cholesterol and, potentially, heart disease. If we eat one rich in omega-3 and other healthy fats, it drops the risk of heart disease. 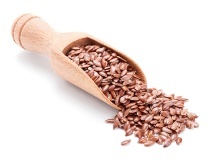 The study succeeded in pinpointing the amount of flaxseed needed: six pounds. At this level, saturated fats in whole milk fat dropped 18%, polyunsaturated fatty acids increased 82%, and omega-3 levels rose 70% compared to no flaxseed. Similar numbers were seen in butter and cheese. The researchers hope that flaxseed will enter the cattle feed market in spite of its more expensive price tag. However, costs could be recouped in grocery store sales, selling these dairy products at a premium, because they are so much healthier. It is something to keep your eye on. We live in a society where very few of us get the necessary levels of omega-3 fatty acids each week. What a great way to get them; floating in our glasses of milk or within the butter we spread on toast. Bobe, G., et al., “Effect of flaxseed supplementation rate and processing on the production, fatty acid profile, and texture of milk, butter, and cheese,” Journal of Dairy Science February 2013; 96: 177–1,188.